The availability of new agents for the treatment of multiple myeloma has allowed the use of multiple lines of treatment, but a percentage of patients do not reach to receive this combination because of toxicity and early death. In this regard, a cross-sectional European study evaluated the management of different lines and discontinuation of treatment in 7635 patients from seven countries in routine clinical practice, finding that 39% of European patients do not receive a second line and that only 4% of patients reach third line in Spain, a figure that is striking when comparing with the rest of the countries. We analyze the frequency and causes of treatment discontinuation in a series of 108 patients from a Spanish University hospital showing that the main reason for permanent treatment discontinuation after finishing first line was to have a response, while death due to disease progression accounted for the main reason in subsequent lines of therapy, with its frequency increasing according to the number of lines received. 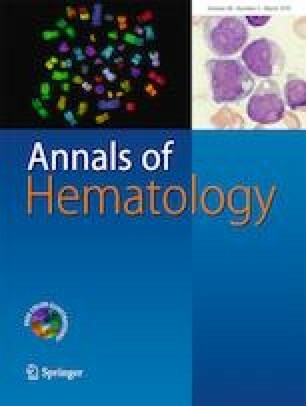 Additionally, in our longitudinal study, we estimated, using a competitive risk analysis, that 22% of patients would not receive a second line of therapy at 60 months and 47% would not reach third line, also at 60 months, showing a marked discrepancy with the results reported in the cross-sectional European study. Although based on limited data, our results suggest the convenience of validating the findings of cross-sectional studies conducted in large cohorts. AS, EA, RBL, and FG-P designed the study, collected data, performed the statistical analysis, and wrote the manuscript. All authors reviewed and approved the final version of the manuscript. Alicia Senín received the support of a SEHH grant for the development of this study 2015-2017.